to welcome you in its embrace and not let go of you. It gets a distinct look thanks to its curved surfaces extending over one another. Rounded corners & edges, curved arm pads & tufted seat have been designed in a manner that it will comfort and pamper you. It is that piece in your living room that will exemplify classic meets modernism. want your furniture to look well-maintained even when you come back from your long day at work, bring Cozy home. remain firm for a long time and retain their shape even after continuous use. The fibre filling provides for a soft and highly comfortable casing to ensure a wonderful seating experience. carly sofa Set Have you ever snuggled into a space where once you plop down, you don’t seem to remember any of your worries or stress? Here’s carly for you – a low height comfortable seating with soft buoyant supporting cushions that is bound to welcome you in its embrace and not let go of you. It gets a distinct look thanks to its curved surfaces extending over one another. Rounded corners & edges, curved arm pads & tufted seat have been designed in a manner that it will comfort and pamper you. It is that piece in your living room that will exemplify classic meets modernism. Upholstery Molphyno : is the stylish, linen look polyester fabric that will turn the spotlight on your furniture. Strong, resilient and comfortable for seating, this hard wearing fabric will be your companion for long. If you have an extremely busy life and want your furniture to look well-maintained even when you come back from your long day at work, bring Cozy home. Frame Top grade solid teak wood frame that ensures stability and durability of the furniture Cushion We believe that cushions add life to your furniture. And where our cushions are concerned, we can say that they will never let you down. Made of high density flexible foam which is wrapped in fibre filling, our cushions promise to remain firm for a long time and retain their shape even after continuous use. 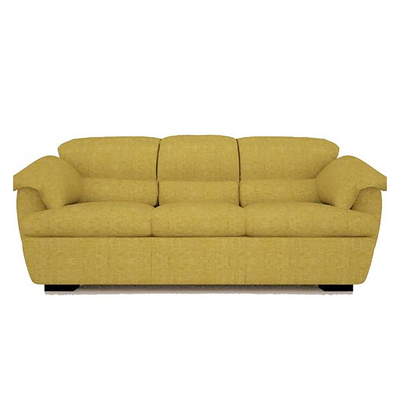 The fibre filling provides for a soft and highly comfortable casing to ensure a wonderful seating experience.